If you care about making really good coffee then you already know that the quality of your grinder is right up there with the quality of the coffee beans you use. Even if you buy the best beans roasted freshly across the street from the best roastery in your town your coffee will just not turn out as good as it could if you don’t grind those beans properly in your own kitchen! Everyone knows that burr grinders are better than blade grinders but not all electric grinders are better than manual grinders – the cheapest burr grinders are severely deficient in many respects to the best manual grinders on the market. If you want to take a step in the direction of making better coffee then you have to be prepared to spend a few dollars on your grinder. The best grinders for the home barista are priced well into the hundreds – you simply can’t expect to get a top performing grinder for less then $100. For those on a tight budget we get it – you can see this page for the best electric coffee grinders under $100 or you can opt for a top of the line manual grinder. For those willing to shell out some dough on making your morning routine taste ohh-so-much better then read on. Before we get into what our favorite grinder in this category is we should take an inventory of the top brands that make electric burr grinders. Baratza Makes Awesome Coffee Grinders! This company only makes grinders! That’s it! Since 1999 the only thing Bartaza has done is make electric burr grinders! Not a single hand grander or blade grinder at all. 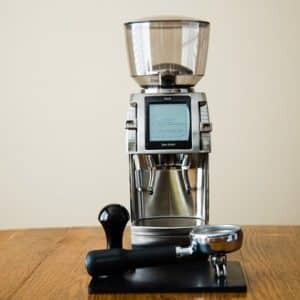 As of early 2018 Baratza currently sells nine different electric burr grinders. 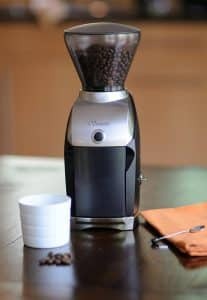 You can see the following page to review and compare all of the Baratza grinders but to summarize their best grinder in our opinion is the Forte AP (All Purpose). It’s not cheap. Their best selling units are much more affordable however and they are good enough to include on the best burr grinder list. The Baratza Encore is well within the budget of most consumers but on the low end of the spectrum we really advise our customers to go for the Virtuoso instead. It’s just a better value. You pay more and you get more in return. Make sure to see our comparison of the Encore and the Virtuoso to help decide which is right for you. The Forte however is in a class of it’s own. It’s truly a “pro-sumer” grinder priced as high as many entry level commercial grinders you only see at cafes! It can grind everything you want with precision that is unmatched in the consumer grade space. Most people are not willing to shell out that kind of coin for the Forte however so there are a few other options on the top shelf that we are advocates for.. that also cost a few hundred bucks less. Mazzer makes top of the line grinders for cafes and coffee shops. Most of their products are geared for the espresso crowd and although most products in the Mazzer line are totally inappropriate for a home coffee bar setup they do have one excellent choice that many people choose to buy for their home operation: the Mazzer Mini. Top of the line Mazzer grinders are only appropriate in our opinion for high volume cafes. The Mazzer Mini however is geared for the home espresso enthusiast who has a lot of money burning holes in their pockets. The Mini comes in basically three different styles, the regular Mini grinder and the Mini Electronic model which comes in both A & B versions. The Mazzer Mini comes with a doser chamber and portafilter holder and is priced much less than the electronic versions. The hopper can be swapped for a smaller kitchen friendly version and it’s costs a lot less than the Baratza Forte featured above. In addition to the Mini, Mazzer makes the slightly more expensive Super Jolly which is also found in home setups as well as their array of larger and super expensive commercial grade electric burr grinders. You can see a more comprehensive comparison of the Mazzer grinders here if you wish to drool all over your shirt. Pricing for the Mazzer Mini however is still extremely expensive for the average consumer so we don’t actually expect a lot of our customers to opt for either the Forte or the Mazzer Mini. Instead lets take a look at the next lower price point down. For people who really love coffee, I mean really love it, this is the brand that many people choose to buy because the quality of their Rocky grinders is exceptional and they cost way less than the Mazzers and top-shelf Baratzas. Rancillio makes two exceptional burr grinders that are both less than half the price of the Baratza Forte and make coffee grind just about as good as you could ever ask want. Of the two we like the HSD-ROC-SS because it comes with a doser chamber but the regular HSD-ROC-SD is just as good and a great option for those of you who don’t want a doser. It’s worth noting here that Rancillio Rocky coffee grinders are amazing machines but the Baratza Vario and Vario-W are arguably better units but they do cost a bit more. Dollar for dollar we think the best value is the Rocky grinder (SS). Note – Click through here if you’re not sure what the difference is between a doser and doserless coffee grinder is. You can also see this comparison between the Rancillio Rocky and the Baratza Vario to see if the more expensive Vario is worth the money. Are these grinders still too spendy for you? 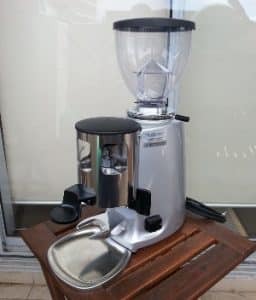 They are the best units for sure but our next batch of electric burr grinders are all priced well under $500 and may make better financial sense for you. Before we get into the next tier down let me point you toward a few other pages on the site that might help you find the right grinder for your kitchen. 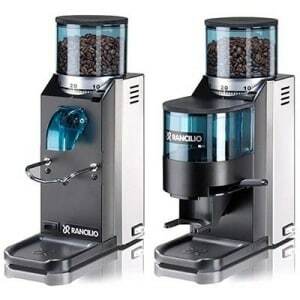 Although Rancillio is an amazing grinder there are cheaper options that are “nearly” just as good in the lower end of Baratza’s line as well as from a few additional companies like Breville, KitchenAid, Gagia, and Oxo. 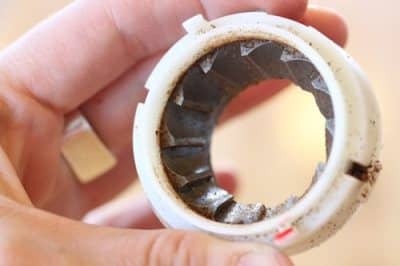 Let’s look at the lower end of premium coffee grinders priced generally between $125 and $300 or so.